talkingeconomics - Sri Lanka Budget 2018: Will Clarity in Thought Translate to Clarity in Action? Slow growth, declining export earnings and FDI inflows, and inadequate foreign exchange reserve cover characterize Sri Lanka’s current macroeconomic climate. The heavy dependency on non-tradables is a key factor slowing the country’s growth momentum. Apart from this structural feature, unfavourable weather conditions that are causing inflationary pressures could potentially dampen growth. Tightening of fiscal and monetary policy further restricts the space to provide stimulus for growth. On the plus side, over the past year, the economy has witnessed an improvement in macroeconomic fundamentals due to fiscal consolidation efforts, aided by a more prudent monetary policy framework and exchange rate management policy. To overcome debt, Sri Lanka has been making efforts to increase its tax take by trying to broaden the tax base and streamlining tax schedules. The Budget 2018 proposals appear to continue this vision. The government is adopting what appears to be a kill-two-birds-with-one-stone strategy, by pitching the Budget for 2018 as a “Blue-Green” Budget, such that several proposals that increase tax revenues go hand in hand in with the sustainable development agenda. Proposals such as the imposition of a carbon tax on selected motor-vehicles (except electric vehicles), sugar tax on sweetened beverages, excise duty on plastic resins to discourage the use of polythene, and tax-exemptions on electric vehicles are some examples. In addition, several other new taxes have been introduced, along with steps to rationalize VAT and NBT exemptions on selected items. Apart from such measures to address Sri Lanka’s fiscal concerns, several progressive proposals to liberalize trade, land, and shipping are seen in the Budget 2018, with the objective of maximizing the country’s locational advantages. For instance, steps to incentivize Foreign Direct Investment (FDI) inflows include removing restrictions on land ownership for companies with foreign ownership and establishing a Public Private Partnership (PPP) unit as a single facilitation point for designing and implementing PPPs. However, under the “Enterprise Lanka” initiative, the Budget 2018 also continues to regurgitate proposals for the small and medium enterprise (SME) sector that have already been seen in previous Budgets, but have not come into fruition, such as establishing a Development Bank with an EXIM window. While the necessity of a new bank to this end is questionable, greater focus should be paid to strengthening the existing regulatory framework, which ensures that existing banks provide adequate financing to SMEs. On the plus side, proposals that address the IT needs of start-ups and exporters are seen under this initiative. Under the “Green Economy” initiative, proposals such as strengthening the climate resilience program and imposing waste disposal restrictions on factories and hotels are positive steps towards building much needed waste management and disaster-ready mechanisms. In addition, the Budget promotes a “Blue Economy” such that ocean resources will be expanded by creating an enabling environment for sustainable fishery ventures along with measures to protect the coastal line from pollution and degradation. It is noteworthy that there is considerable continuity between the government’s Vision 2025 statement and the Budget 2018, which bodes well for policy consistency. Tax Proposals: Ability to Meet Fiscal Targets? A tax on transactions among financial institutions, sugar tax on sweetened beverages, cellular tower and SMS-advertising levy, and a carbon tax on motor vehicles are among the newly introduced taxes; several of these address environmental and health concerns. Further, there is an expansion of the list of items no longer liable for exemptions on VAT and NBT (continuation from the previous Budget). Moreover, we see a commitment in the 2018 Budget towards “rationalizing the tax system by minimizing exemptions, holidays, and special rates, towards a fair and effective tax administration” as stated in Vision 2025. Although these are positive steps taken towards improving the tax base, it is questionable as to how far the government’s objective of shifting tax dependency towards direct taxation (from an indirect to direct tax ratio of 80:20 to 60:40) can be achieved with these proposals. This will largely depend on the implementation of the Revenue Administration Management Information System (RAMIS) in line with the new Inland Revenue Act. The adequacy of these measures to achieve the revenue target of 16% of GDP from a level of 12% at end 2016, depends on how far the government is able to follow-through with its stated commitments. For instance, in the 2015-2016 period the government struggled to implement budget proposals on the upward revision of VAT due to public opposition; proposals were implemented, repealed and re-implemented. This kind of back and forth behaviour in budget implementation should be avoided, if desired fiscal targets are to be achieved. Given the macroeconomic situation and the necessity to improve the capacity to repay loans over the next three years, a significant amount of emphasis is directed at attracting FDI. In order to achieve this, the budget statement has committed itself to implementing several policy reforms that seek to address factors undermining the investment climate. Sri Lanka has long suffered from a complex para-tariff structure introduced to finance military spending during the conflict and continued thereafter due to a protectionist economic vision. Consequently, Sri Lanka’s economic competitiveness has eroded over the years and few firms have successfully integrated into global value chains. In this regard, the Budget 2018 has proposed to remove 1200 para-tariffs on import items that at present do not carry any customs duties. Moreover, CESS will also be removed from 253 items to facilitate emerging sectors such as tourism and value adding industries. This is in line with efforts to liberalize trade, reduce border inefficiencies, and capitalize on Sri Lanka’s locational advantages as a trading hub. Beyond budgetary measures, the statement also proposed several policy reforms that are expected to improve the ease of doing business in Sri Lanka. The current restriction on foreign ownership of shipping and freight forwarding business has been lifted. The relaxation of this restriction and the subsequent entry of large, international shipping and freight forwarding players will be vital if Sri Lanka is to realistically establish itself as a logistics hub in the region. Furthermore, restrictions on foreigners acquiring freehold rights of land are also to be lifted. It should be noted, however, that this proposal was initially put forward in Budget 2017, but was never legislated upon. Issues pertaining to land ownership have been cited, for many years, as a severe hindrance to attracting foreign investment, due to the absence of investment security. 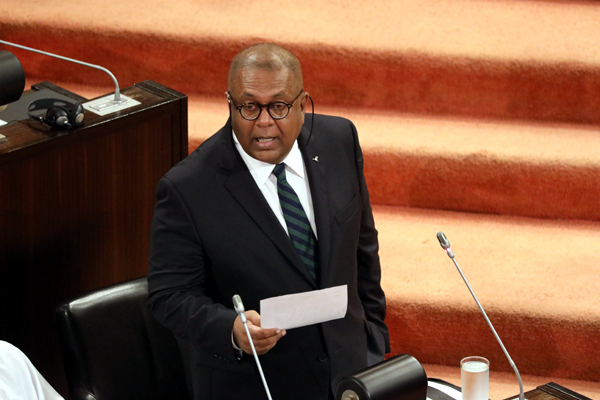 In a similar vein, in order to provide greater security for foreign investment, the government has also expressed its intent to repeal the “Revival of Underperforming Enterprises or Underutilized Assets Act”. While these proposals are commendable, the absence of a clear timeline under which they are to be implemented is a cause for concern. Sri Lanka faces its largest foreign debt-servicing requirement amounting to approximately US$ 15 billion between 2019 and 2022, and the vision of the Budget 2018 is geared towards facing this challenge. As a result, the focus of the Budget has rightly been on addressing the twin-challenge facing the Sri Lankan economy: stabilising macroeconomic fundamentals while stimulating growth. Therefore, the economy is in urgent need of creating non-debt creating foreign currency inflows. In the short-term, it is unlikely that the country’s export sector will successfully transform to generate adequate revenue, and therefore the onus is firmly on FDI. The opening of new industrial zones, liberalization of investment and trade policy, and the conclusion of Free Trade Agreement (FTA) negotiations with India, China, and Singapore are all expected to create the necessary recipe in attracting FDI and stimulating the economy. In the medium to long term, the Budget’s proposals in transforming the education and healthcare sectors, along with providing viable means of finance for SMEs will have a positive impact as well. The relative clarity in linking the needs of the economy with the Budget’s policy proposals, and the absence of populist and ad-hoc measures are particularly encouraging. Moreover, the complementarity of the Budget 2018 and the government’s Vision 2025 agenda also provides much needed policy consistency. However, many of the proposals made lack a defined timeline of implementation and will undoubtedly be subject to lobbying by special interests. As a result, the effectiveness of these proposals and its impact on the economy depend on the political will towards successful implementation. While the establishment of a Budget Implementation Unit under the Ministry of Finance is a positive first step, Sri Lanka’s economic sustainability depends on a lot more.